Held for a limited time, this mode is compete for ranking in that period. Each Racer Event held by different of Type and scale, course and models. Demonstrate the results of driving daily, aim the ranking in and Prize! 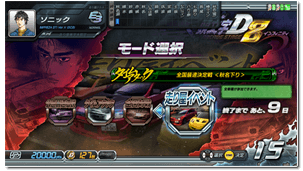 * For play the Racer Event, you must have "Initial D Driver license". "Akina" Championship with New Year's Greetings ! * Any car models can participate. * Root , Weather and Time are randomly selected each race. The 3rd Drift Contest Battle "Happogahara Outbound"
* "Drift Contest"compete in "Event Score" by 5 races. * It is possible to participate only in NISSAN cars. © Shuichi Shigeno/KODANSHA All Rights Reserved. Manufactured and produced by SEGA under license from Kodansha Ltd.
trademarks and/or copyrighted materials of their respective owners. All rights reserved.